2012 was nothing if not colorful. The rains came and I watched countless downpours and sun showers in wonder. Flowers bloomed brilliantly and the sun and moon stunned as they made their way across the sky, framed by backdrops of vivid strokes, the likes of which sent me tearing through the house to find my camera on many an occasion. 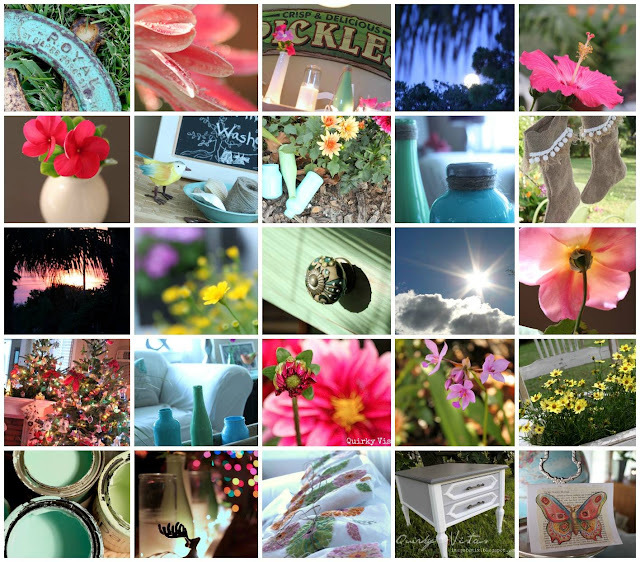 My world took on aqua hues this year, which brightened up my home inside and out. Junk was forced at the point of a drill and a sander to shape up and become something. Little rescued rascals became dashing and respectable contributors to the world, functioning as they were meant to with more than a little style to show for it once their rehab was complete. I even managed to find a needle and some embroidery thread and got back to doing a little stitching. From curbside treasure hunts to back patio gardening, to paint cans and saucepans and a humongous pickle, life has been colorful, rewarding and fun this year. I may yet get around to a presentation of favorite posts, but for now in case I get sidetracked, you can find links to any and all of this year's Quirky Vistas posts on the left sidebar. My grateful thanks to everyone who came by and took the time to read my often wordy tales, left me comments, followed and even spent time chatting by email. It's been my pleasure to share stories and find a common thread with so many of you. In the year to come, I'll be branching out with an Etsy shop - also called Quirky Vistas, and hopefully it will be up and running with some goodies shortly. I'm getting there! I look forward to the bright outcomes ahead. Who knows what we'll all get into in 2013. Whatever we do, I'm sure stories will be told and photographs will be taken...lots of them. I look forward to it. January isn't getting any younger and neither am I, so let's get busy! I can't wait to see what you list in your Etsy shop! I'm goad we connected this year...Here's to an even MORE fab 2013! I remember the pickle well. It was one of my favorites. I also loved the night stand and the table with the transfer not shown. I can't wait to see your etsy shop. Liz, your eye for photography and your overall outlook on life are amazing; thanks for sharing! I'm so happy I found your blog earlier this year. I love your writing style, and your eye for photography. You rock! So I tell my daughter I need to make a sign, go to interest and fine one you like. She yells to me... Found one, you'll love it. I come to see.... It is your pickle. I do love it, but I had to tell her I am just not sure I was thinking green! The collage is great it looks like you've had a busy year. What a beautiful post! Both the pictures and the words! I always love your pictures and to see such a beautiful collage of them....just lovely! Good luck on your etsy and congrats! Looking forward to it as well!